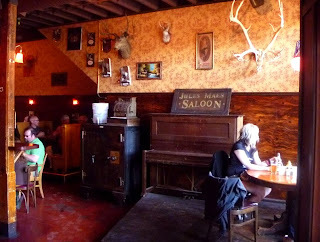 Jules Maes Saloon - Georgetown and its SoDo surroundings are now, with zero doubt, the coolest neighborhood in Seattle. The "new Ballard" was once a little premature, but it now underestimates the area. E.g. the Rainier Cold Storage building across the street** from Jules front door, which makes you believe you can't possibly be in Seattle -- or for that matter, the west coast. Jules is in a space constructed in 1898 and which first hosted a saloon in 1907*, and few places in the country retain the flavor of the term "Saloon" any better. To be reborn with this level of shabby grandeur -- a big, late night roadhouse that creates the place to be in the middle of nowhere -- reminds one of the excitement that precedes the gentrification and inevitable of neighborhoods of character in wealthy cities. 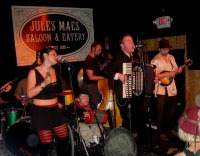 I went on the night of the CD release from The Bad Things, so it was unusually rife with history -- rockabilly heels and tattoos mixing with the 30's clothing of the acid folkies that follow the Things. Georgetown is like being in an entirely different city, and this night was an entirely different era. 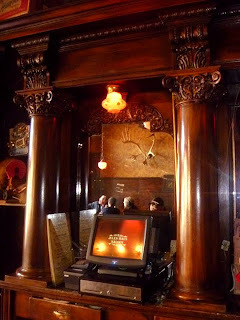 My manfriend's grandmother used to cook at Jules Maes back in the fifty's and sixties. He can remember going in there and helping her with the clean up and such. He has great memories of the place. We went there recently and the service is great and the food is pretty good too.